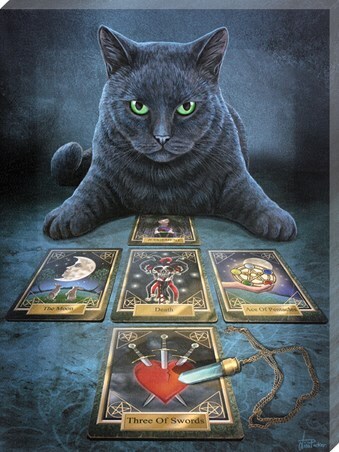 With his green eyes piercing into your soul, this witches cat has someone's fate laid out right in front of him. Whether you're the reader or the fate beholder, these powerful cards tell a story of sorrow, new beginnings, death and unconscious dreams! This moonlit canvas print by Lisa Parker is sure to illuminate any room with mystery and beauty, perfect for any lover of fantasy art to add to their collection! High quality, framed The Reader, Lisa Parker canvas print with a bespoke frame by our custom framing service.